Good evening fellow scrappers! 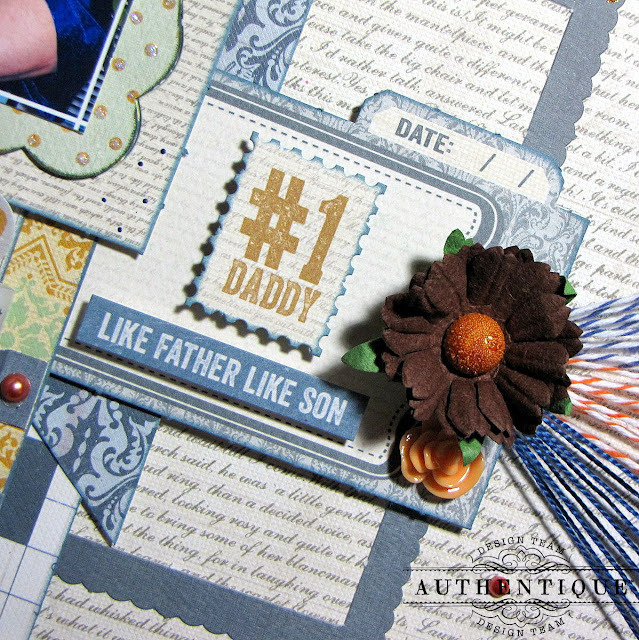 Today I'm sharing a page that recently went up on the Authentique blog. I've used papers from their fabulous 'Strong' collection. The patterns, designs & colors of this collection are absolutely perfect for masculine themed pages. Lately I've been taken several photos of my husband & son together & this one is my most recent favorite. Here they are on Superbowl Sunday posing in matching NY Giants jerseys. Eli Manning jerseys to be exact! My husband is making sure that my son is a die hard NY Giants fan from very early on. From a scrapper's point of view I noticed that the bright blue colors of the jerseys went along perfectly with the colors in the 'Strong' collection. :-) That's how I see most of my photos...what's the predominant color in the photo and which papers fit that photo best. I'm sure many of you are used to seeing my journaling stored in the form of a scroll. I just can't get enough of this way of storing journaling. I love it!! Can you tell? I only seem to use it in just about every other layout I do. For me it's been a life saver since I tend to tell a story with all of my pages. I had to always adhere my story to the back and I didn't really want to do that--being able to store my story as part of my page, keeping it private & being able to add a unique type of embellishment to my page satisfies all my needs! So I think you'll be seeing these little scrolls for a bit longer! If anyone is interested, I did make a tutorial on how I go about making these scrolls. You can find that tutorial here. 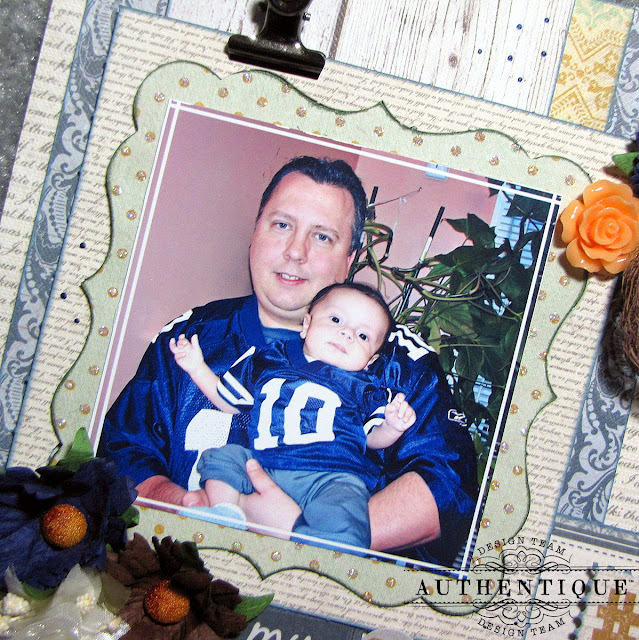 I framed my photo with elements & die cuts that come with the 'Strong' collection. I just inked the edges a bit and highlighted the polka dots on the patterned paper by adding a bit of Star Dust Stickles to them. 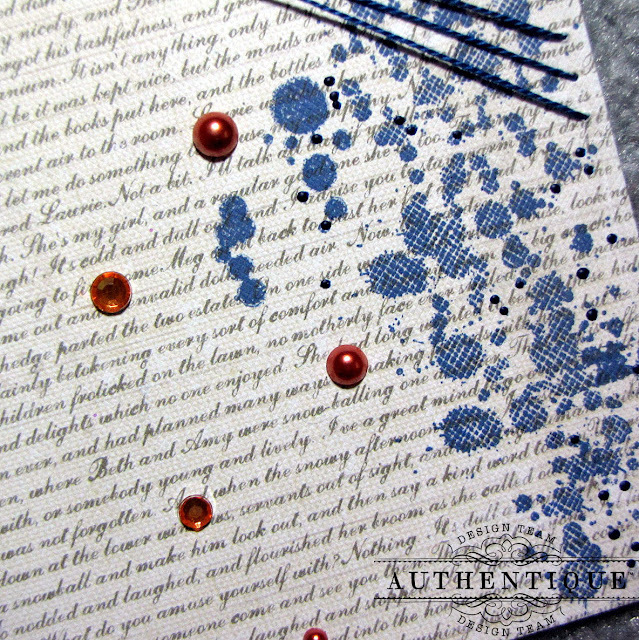 The splatters were made with a stamp by Vilda Stamps conveniently called 'Splatter'. I also added dots of dark blue acrylic paint to the splatters. I randomly adhered a bit of pearls & rhinestones onto my background. I decided to do a bit of fancy stitching on this page. I combined both bakers twine & embroidery floss to create these very long stitches. With a paper piercer I've pierced holes along the border. 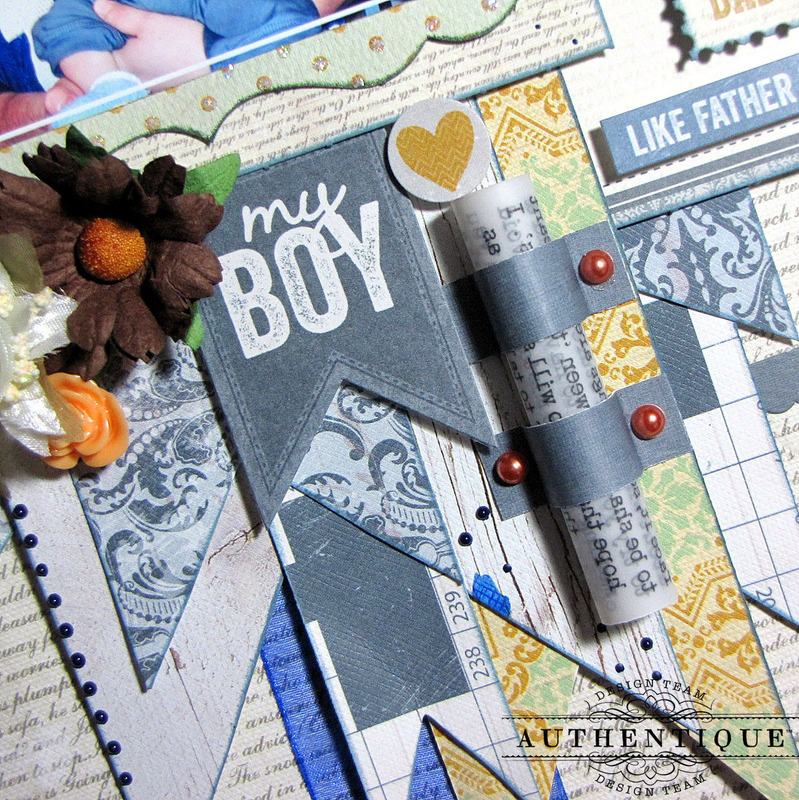 I used the 12" Design Ruler by Tim Holtz to pierce the holes. This ruler has holes in it just for this purpose. I pierced every other hole in order to space out my twine/floss. I then strung the twine through a needle and this is how I thread my twine/floss through the pierced hole & the mini note that is holding my title as well. With a 3/16" circle hand punch, I've punched a hole in the middle of the mini note (elements that also come with the 'Strong' collection) and converted the mini note into a tag. Instead of stringing ribbon through the hole--I instead reinforced the punched hole with an eyelet & strung the baker's twine & embroidery floss through it. I then covered all that strung twine & floss with a brown mulberry paper daisy. Thanks for stopping by--your visits are always truly appreciated. Enjoy the rest of the week! 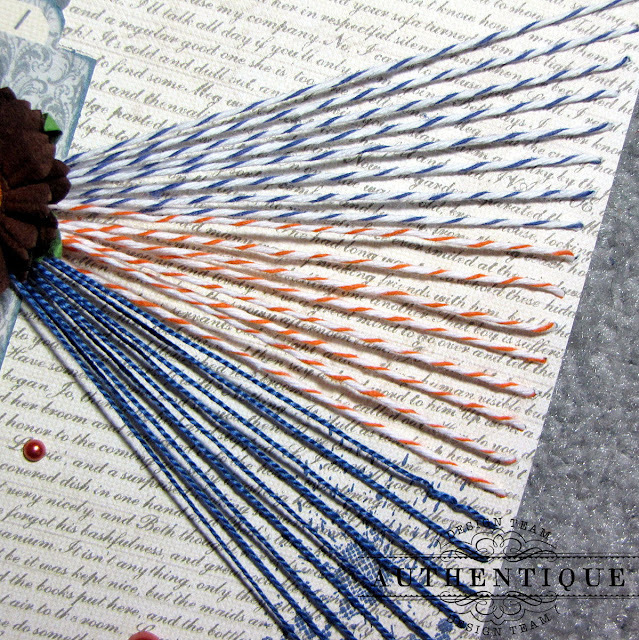 Gee, love how you've done that twine...AMAZING....gorgeous LO - sooo much to look at & Study!!!!! He is growing. Love the perfect alignment of the twine! Kay this is wonderful... I really love what you did with the twine and what an awesome way to hold the journalling... such an inspiration. Oh, wow!! 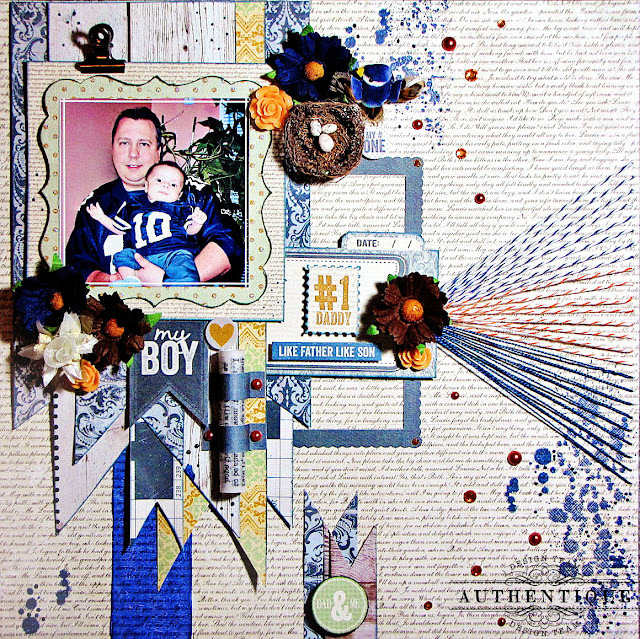 The detail in this layout is just phenomenal..I adore what you did with the twine...looks awesome!! Gorgeous work, as always! !